Insight Glass uses top quality hardware from C.R. Laurence Co. Inc. and U.S. Horizon, recognized industry leaders in shower enclosure hardware. These manufacturers offer a huge supply of hardware in many colors and in many styles. It can be a bit overwhelming choosing the right color and style for your new shower enclosure so Insight Glass has listed the more common colors and styles to assist you. Door Hinges: Most heavy glass shower enclosures will require two door hinges unless you have an extremely large door. The most popular hinge is the CRL Cologne hinge, which has a radius corner and a beveled edge to provide a sleek appearance. 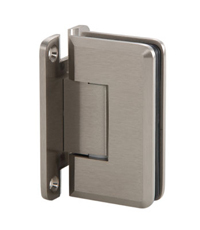 This is the popular Cologne Wall Mount Hinge and the U.S. Horizon Majestic Hinge. With these hinges, the door is hinged on the wall which is the most common configuration. These series of hinges also come in a 180 degree glass-to-glass configuration and a 135 degree Neo Angle configuration. Door Handle: The most popular door handle is the 6" BM series tubular back-to-back pull that comes with decorative metal washers. 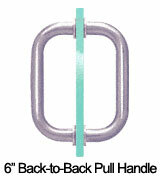 This is the popular 6" BM series tubular back-to-back pull which also comes in an 8" size. The only other hardware item you may need to choose is Clips. If you choose to have your shower enclosure installed with U-Channel, obviously this is not a concern. In case you are interested, a picture of our standard, quality U-Channel follows (in the color of your choice of course). This is the standard quality U-Channel you will get - In the color of your choosing. Clips: The most popular clip is the CRL Beveled, heavy duty glass clip made of solid brass. This is the popular Beveled, heavy duty glass clip made of solid brass. As you can see, there are many colors and styles of hardware to choose from. It has been our experience, most customers are more than happy with the popular styles shown above. If you are interested in the main CRL index of hardware options, click here. Insight Glass hopes this page helped answer some of your questions. We serve the entire Greater San Francisco Bay area with beautiful semi frameless and frameless shower enclosures. 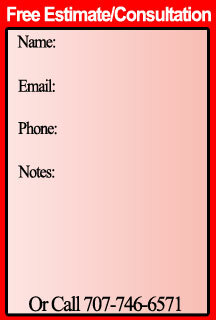 If you have any questions, please call us at (707) 746-6571 or take a minute to send us a quick email. We would love to hear from you.